Last week, I turned 26. 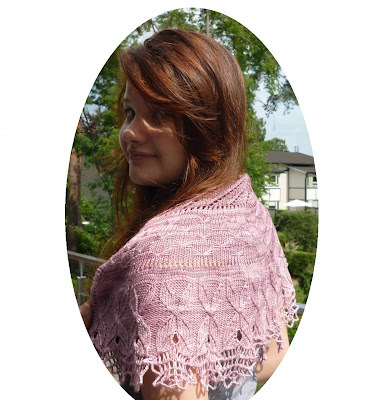 On the same day, I decided to release Bashful Butterflies, a small summer scarf or medium shawlette, depending on yarn choice and gauge. The 4ply version uses under 100g and the DK version uses under 200g. You can get it either through Ravelry or The Unique Sheep’ website. And of course, my three test knitters (Sadie, Amy and Sharon) have been fabulous, like they always are. And the pattern is currently being tested by a fourth for exact Gradiance instructions, so once those are up, I’ll let everyone know about the updated version. In other knitting news, the Lissajous are done. It’s a bit weird not having any socks otn right now, but that’ll be remedied tomorrow when I’ll be casting on a pair of Twisted Flowers in a happy yellow. In the meantime, I’ve been working on my Dr Seuss Shawl (aka Green Egg Omelet). The pattern, Omelet, has so many charts! I completed Chart B and C today, and am two rows into Chart D (20 rows total). Still got Chart E (34 rows) to go! The rows are getting really long now. But I just keep thinking how pretty the finished product will be and keep going. And thanks to Nina, it’s been so easy to keep track of where I am in the pattern. She recommended the StitchMinder app and it’s great. Speaking of apps, I’ve also started using RunKeeper when I go on my runs. I didn’t realize how far I was actually going on my daily runs. Last Sunday, I decided to go for a hike instead of a run. But because I lost GPS, the app now thinks it took me an hour to do a mile when I really did four miles (a lot of it uphill!). Ah well. Yesterday, I went to the Vintage Fair with Nina and Lucy. I didn’t find any clothing that I wanted to buy, but I did get a pretty rose necklace and some rose hair pins. Then we went shopping on Fargate. It really annoys me that there isn’t a standardized size. So what’s one size in New Look is actually in between sizes in Dorothy Perkins. Makes shopping for clothes very difficult. But I did find a pair of trousers to wear to work, two shirts and a pair of leggings. The next time we go to Meadowhall I’ll try both New Look and Dorothy Perkins again since their shops are bigger there.